Just arriving at the festival grounds hours before, I start making my way around to check out the sights so to speak - I'm digging Copenhell so far. The people are kind, everywhere I look there are smiles, hugs, horns, beers and pale shirtless beer bellies! Walking towards the stage I see people chatting and drinking beer, enjoying each others company - the sun is out, it's humid and hot as he'll! Very appropriate! But what does it matter, we are all sweaty and smelly - just as it's supposed to be! The atmosphere is relaxed and there is an ease to it all. 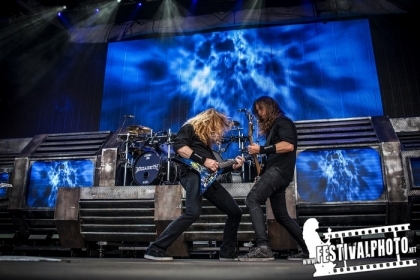 My first experience at Copenhell will be the metalGIANTS that is Megadeth! This will be my first live experience ever with this genre of music, and I am getting excited! I get to the Helviti stage and just minutes later 2 enormous fireballs shoots to the sky to let the crowd know, that it's just about time for Megadeth to take the stage! As I'm new to this festival I had no idea that would happen - I nearly piss myself, much to the amusement of the people standing around me! It is still day and the dusk hasen’t settled yet - It's obvious by the size and participation of the crowd that it is early in the evening! People are still chilling and just hanging around but when the drummer rises from then deep dark belly of the stage he gets a roar of a welcome! Attention is now on the stage and on Megadeth! 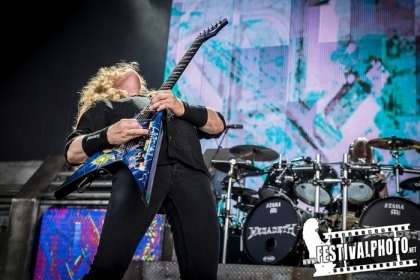 During the first tracks there is some head nodding, it seems Megadeth doesn't win the crowd over that easily! The front 10 rows are all in, even a girl at about 10 years lifted to her fathers shoulders, is throwing horns before the rest of the crowd start joining in. It's clear to me though, that people here are excited for this show and there is a sense of anticipation is in the air! When front man Dave Mustaine greets the crowd with a "Good evening - thank you for being here” by the third song, the crowd responds with the loudest roar so far! From here on, we're off! I see bleeding knees, beer flowing, crowdsurfing, a lot of serious headbanging and hugs shared between brothers - people are having a great time, they're obviously happy to be here celebrating this giant band! 8 songs in the band leave the stage and are brought back by the chanting of the crowd - they are not ready to let these guys go yet! I am blown away by how loud and well this band plays! I think I actually heard some jaws dropping to the concrete floor of Copenhell several times during the show!